For the past 10 weeks I have been part of a new program at DeAnza college for leadership development. 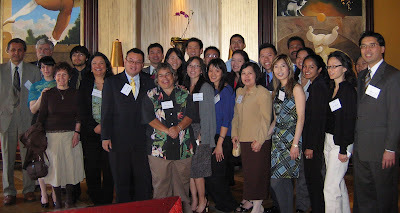 It is part of the Asian Pacific American Leadership Institute (APALI). The focus was on cross cultural education with Latinos and APAs. For me it was so much more. The two teachers, Michael Chang and Ruben Abrica are both on faculty at DeAnza but also political types. Michael is a former mayor of Cupertino and Ruben is on the East Palo Alto City Council and a former mayor of that city also. It was their vision to create this program. We had speakers in to talk about leadership, politics, non-profits and various other topics. But the real joy of being int he class was the other students. Sharing our stories, frustrations, experiences not to mention hopes and dreams was nothing short of wonderful and revolutionary. My work group of Anne Im, Winnie Lee and Linda Leu has just about broken my fun meter. We have laughed and laughed but our project is going to be awesome. If we can stop laughing long enough to present it. There are a number of us who are working together on other projects outside of class. This is where the revolution begins. If we can create a wave of community activism between the two groups, however small it is, we can change many things in Silicon Valley. I am very interested in expanding the notion of immigration being simply a Latino issue. By working collaboratively with the APA community we can change conversations here. We saw that already with testimony offered at the San Jose City Council in support of an immigrant friendly resolution passed last month. There were five people from the class there and two of us testified for passage of the resolution. The time has flown by and I am deeply sad that I won't be getting the chance to see everyone every week. Guess this gives me an excuse to call up folks and try to find ways to work together again.